You see, you need to build the machine to deliver your brilliance – and the better the machine the more effective the fuel that you feed it with. The greatest football teams struggle when they are made to play on a lumpy pitch. It is no surprise that the world’s leading chefs choose the finest ingredients and work in state of the art kitchens. Parents send their children to the best school they can afford, movie stars travel to premiers in Rolls Royces and we’d all wear Gucci if we could afford it (well maybe the last example is simply a matter of taste). But the point is that the mechanics behind what you are trying to achieve can make a massive difference to its success. People say that ‘a bad workman blames his tools’ but the fact is that if you put poor quality tools in the hands of a master craftsmen he will still struggle. The chances of someone creating a true masterpiece are significantly increased by the equipment that is available to them. The same logic applies when marketing your business. 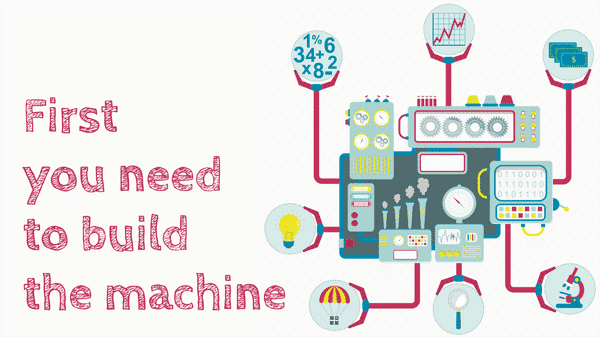 You need to build the machine well before you can start to deliver the message. Once you have a reliable, flexible, efficient, reactive and manageable system in place you can start to feed it your messages, your marketing and the value that your customers are looking to receive from you. And if you have a really good machine, which has been correctly set up then you will be able to adapt and perfect its operating system until it is working in perfect harmony with the needs of your marketplace. So if you are the fastest, the smartest, the most creative or the most talented at what you do, then make sure that the world has an opportunity to enjoy your skills. It is an unfortunate observation in business that ‘a bad product, well-marketed, will always outsell a good product, badly-marketed’. But when you have a great product which is supported by a state-of-the-art delivery machine and an attention-grabbing sales message, you will beat all-comers. The sad truth is that, in many cases, the most celebrated people in the world are not necessarily the most talented and that so much potential is missed or wasted. Make sure that your talent is seen by all of the right people in all of the right places by attaching it to a machine which can amplify your message and take you to your audience.